Live, solo and electronic percussionist BONGO BEN has been a key feature performing on the UK and International club circuit for over 6 years across nightclubs, festivals and pool parties. 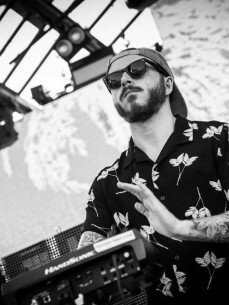 Ben’s impressive CV includes Ushuaia supporting Tinie Tempah, Space and Hard Rock Hotel in Ibiza, Cavalli Club and Nikki Beach Marbella, Toyroom and Movida Dubai as well as Pacha London to name a few. Venues aside, the live musician can claim appearances at V Festival 2015 & 2016 w/Lovejuice and Mixmag where his set was streamed live on Capital FM, We Are FSTVL 2015 & 2016, ADE Amsterdam and even exclusively at the 2012 London Olympic Games.